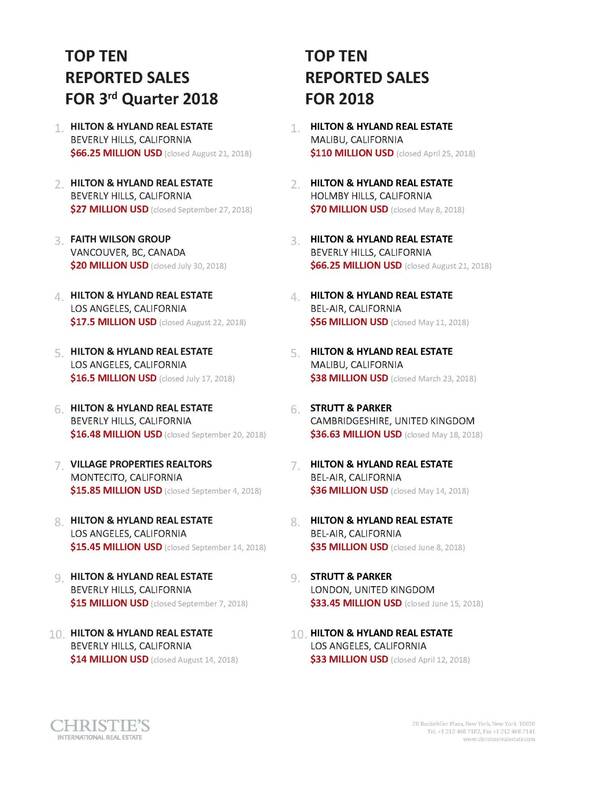 The newest report from Christie’s International Real Estate further proves that Hilton & Hyland has not only redefined the new standard for luxury real estate, but continues to maintain a stronghold on top sales worldwide among Christie’s premier affiliates. The collection of Christie’s brokerages not only represents the finest in Los Angeles, but the finest across the globe. There are many leading international brokerages affiliated with Christie’s, and Hilton & Hyland takes great pride in their partnership and association as Founding Affiliate. Among top reported sales, Hilton & Hyland maintains 80% of the Top 10 International Sales, including Los Angeles’ highest record sale of the year. Commanding nearly half of the $20+ Million market share, it is to no surprise that no other brokerage has sold more top properties than Hilton & Hyland. To view the entire list of Christie’s Significant sales, see above or CLICK HERE.